Tel Aviv Rabbinical Court refuses to approve ceremony for two missionaries wishing to marry. The Tel Aviv-Jaffa Regional Rabbinical Court rejected the request of a missionary couple who sought to marry according to Jewish law. 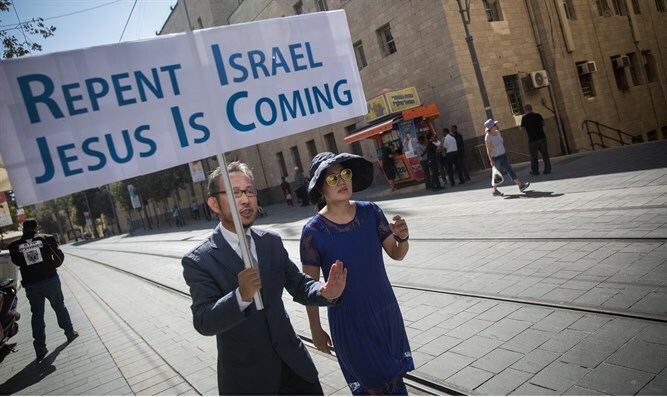 Prior to the hearing, the court summoned an expert on cults from the Yad L'Achim anti-missionary organization to ask the petitioners about their faith. The two did not deny their beliefs and declared openly that they believed in Jesus and his being "the Messiah". The court "reached the conclusion that the applicants converted to the Christian religion, replaced the Jewish faith in the Creator of the world with Christian faith and were even baptized for that purpose." The court emphasized that "the applicants see their mission as one of spreading the message of Christianity and that they want the entire Jewish people to accept their faith." The applicants belong to the Tiferet Yeshua community, a missionary community of Jews who believe in Jesus. After a series of deliberations including sources from the Sages and halakhic rulings on those converting to Judaism, the members of the court's special panel wrote that "the request of those who wish to arrange a chuppah and kiddushin according to the law of Moses and Israel is rejected." The court further ruled that "If the applicants undergo conversion to Judaism in the Chief Rabbinate's court after accepting the principles of Jewish faith including belief in one G-d and the Thirteen Principles of Faith, and declare to the court that they are abandoning their Christian faith, including membership in the Messianic Jewish community and missionary activities, the Court will reconsider their case." The Yad L'Achim organization, which has stood for more than a decade in the struggle against missionaries and cults, said, "We estimate that these missionaries, who indeed converted from Judaism, had another intention to marry as Jews: It is reasonable to assume that they intended to use this in their missionary propaganda, to show their marriage certificate to anyone they intended to deceive that it is possible to be a Jew in every way and at the same time to believe in 'that person' and to expect his revelation." Rabbi Shmuel Lifshitz, one of the leaders of Yad L'Achim, said "Blessed is the One Who gave His world into good hands. They proved that there is someone on his guard who does not allow infiltration into the people of Israel."